Learn more about how to be part of our new Dodge Dart Install Partner Program. You just might end up with a free dash! Sign up today! NEW Classic Dash article on Bangshift.com! Bangshift.com did an article on February 24th about Classic Dash and all of our new RACEPAK and HOLLEY dash panels. Classic Dash article. 2018 Classic Dash Event Schedule is here! New Series 2 RACEPAK Dash Panels now available! 1987-89 Mustang Fox Body Plug-and-Play Harness is BACK! New Series 1 RACEPAK Dash Panels now available! Hot August Nights Winner !!!!! Congratulations To Kristina Rogers From Creswell, OR for winning $250.00 gift card !!!! 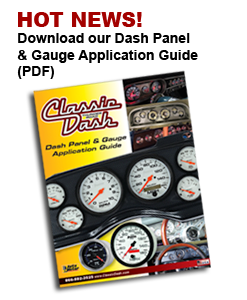 Dash Panel & Gauge Application Guide! This video describes the various types of speedometers and installation requirements, as well as an overview of related panels and instruments available from Classic Dash. The complete Classic Dash product line guide is now downloadable in a PDF. Check out the Classic Dash panel installation story now posted on ChevyHardcore.com.